Avengers EndGame Full Movie Leaked Online by TamilRockers; Marvel’s Superhero Film Available for Free Download Before Official Release Date! Srinagar, March 22: Two terrorists of Pakistan-based terror outfit Jaish-e-Mohammed were gunned down on Friday in an encounter with security forces in Jammu and Kashmir’s Sopore. Havey cache of arms and ammunition was recovered from slain terrorists. The identities of terrorists were being ascertained. Meanwhile, another terrorist was killed in a gunfight between militants and security forces in Shopian district. "Two top terrorists of JeM were eliminated. There was no collateral damage and no injuries to the security personnel. Their identities are yet to be ascertained. The public is requested not to venture into the operational area until it is sanitised," DIG South Kashmir Atul Kumar Goel told reporters. Following information about presence of militants, security forces launched a cordon and search operation in Warpora area of Sopore in Baramulla district late on Thursday. Rahul Gandhi Attacks Narendra Modi, Says ‘Tell Pulwama Victim Families Who Released Masood Azhar’. The exchange of fire started after the terrorists opened fire at the searching party. An encounter also broke out between militants and security forces in the Shopian district on Friday. One terrorist was neutralised. 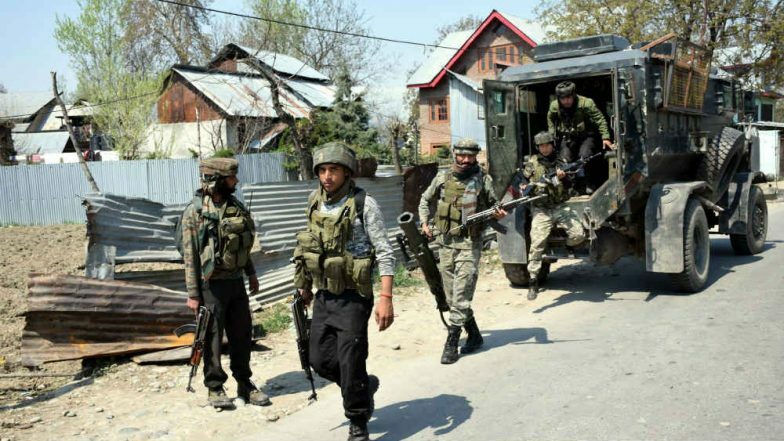 Security forces launched a cordon and search operation in the Imam Sahib area of Shopian in south Kashmir following information about presence of militants there, a police official told news agency PTI. On Thursday, three militants were killed while seven security men and three civilians injured in three different battles between security forces and militants in the Kashmir Valley. On February 18, security forces gunned down the mastermind of the Pulwama terror attack along with two other terrorists of JeM. It is worth mentioning that around 40 CRPF personnel were killed when a suicide bomber rammed into a convoy while moving from Jammu to Srinagar in Lethpora area of South Kashmir Pulwama district on February 14 around 3:15 pm. The Pakistan based terror outfit JeM claimed the responsibility of the attack.